HUMANITIES AND LNCO SIDEWALK: The sidewalk between the humanities building and LNCO will be closed starting in June for one month in conjunction with the capital improvements north of LNCO. STUDENT LIFE TRAX BORE: The southeast corner of the Eccles Student Life Center parking lot is being used as a staging area for a TRAX bore. Deliveries will be received and stored on the northeast corner of the building. Pedestrians should use the alternate route indicated. SOUTH CAMPUS DRIVE: Road mill and overlay construction will be occurring from 10 p.m. to 6 a.m. along South Campus Drive. Nightly segmented road closures should be expected throughout the duration of the project. MARIO CAPECCHI DRIVE: Road mill and overlay construction. Nightly sectional closures between 10 p.m. and 6 a.m.
MARIO CAPECCHI SIDEWALK: The east side of Mario Capecchi Drive will be closed from June to September 2018 to construct a sidewalk along the road. The project is expected to be complete at the end of September 2018. GARDNER AND KINGSBURY HALL HIGH TEMP: High temp water pipeline replacement will occur on the north side of Gardner Hall stretching around the corner to the west side of Kingsbury. Re-insulated triple wall pipe will be installed. Area will be closed and fenced off until the competition date of Oct. 18, 2018. NORTH CAMPUS DRIVE: Construction is anticipated to begin as early as June 17. Work for this phase of the project has shifted to nights and weekends. The project team has worked closely with campus hospitals to coordinate phasing in a way that minimizes disruptions and impacts to patients as much as possible. Due to initial project impacts to hospital access, the project team has agreed to night work so both eastbound travel lanes and one westbound lane can remain open during peak patient travel times to further reduce impacts. North Campus will be rough, with uneven lanes and possible loose gravel throughout construction. Once work begins, alternative routes are encouraged. The project team remains committed to completing reconstruction prior to the beginning of fall semester. WEB/MCE/HEDCO ASPHALT REPAIRS: Asphalt repair is being done in the front parking lot between WEB, MCE and Hedco. Minor disruptions will occur. This project is expected to be complete July 1, 2018. CAMPUS WIDE LIGHTING UPGRADE: Various minor sidewalk disruptions will occur throughout campus from now until the end of July 2018, for campus-wide sidewalk lighting upgrades and installations. UDOT SUMMER CONSTRUCTION CHANGES: UDOT is postponing work on North Campus Drive while UDOT collaborates with the university to revise the construction and traffic plan. In the meantime, UDOT has shifted its resources to begin asphalt removal and replacement on Mario Capecchi Drive between North Campus Drive and Foothill Drive. Single lane closures are scheduled to occur nightly. It is recommended that motorists leave early and plan for extra time — 15-minute delays can be expected. All lanes will remain open to accommodate traffic during the morning and afternoon commutes. One lane will remain open in each direction during night work, and 24/7 on the weekends. Two eastbound lanes on North Campus Drive (toward the hospital) and one westbound lane (away from the hospital) will remain open and fully operational for the time being. Updates from UDOT are also available by calling 1-888-556-0232 or emailing campusdrive@utah.gov. Those updates will also be posted on Twitter @uofutraffic and online on @theU. Twitter users can receive text message updates on the project by texting “Follow @uofutraffic” to 40404. Visit the UDOT construction project page for more information. BEH S SEISMIC UPGRADE: Surrounding areas of the Social & Behavioral Science building will be fenced off for a seismic upgrade periodically throughout the duration of the project. This area will reopen July 17, 2018. SIDEWALK IMPACTS NEAR HPER EAST AND HUNTSMAN BASKETBALL FACILITY: Phase IIA of the South Campus Housing Utility relocation began June 1, 2018. The initial fence along the sidewalk between Hyper East and Student life Center/the soccer field will be taken down. Fencing will be put up around the southwest side of the Honors housing parking lot. Phase 11B is expected to begin mid-July 2018 where the remainder of the fence along the east side of the honor housing lot will be put up. No access in the gated area is permitted. Pedestrians should navigate around these fences and use alternative routes as designated by signage. EAST MEDICAL DRIVE ROAD: The road repaving project is complete along East medical Drive between the School of Medicine and HCI Research South. Traffic is limited to one lane with an alternating traffic light to allow flow of traffic both directions. BUSINESS LOOP ROAD CIRCULATION AND IMPROVEMENTS: Work has begun along Central Campus Drive to convert a portion of the road into a pedestrian plaza. The works will resolve active transit and ADA paths of travel. Work will continue throughout the summer and be ready for fall 2018. STUDENT SERVICES DECK: The deck on the east side of the Student Services building is being replaced. Access through the northeast and East doors (main doors) will be closed. Please access this building from the Southeast or West side doors. The construction will last through the summer and reopen in time for fall semester. HPER NORTH CONSTRUCTION: Construction surrounding HPER North has begun and will last throughout the summer 2018. The building is getting new exterior windows installed. Minor disruptions may occur. 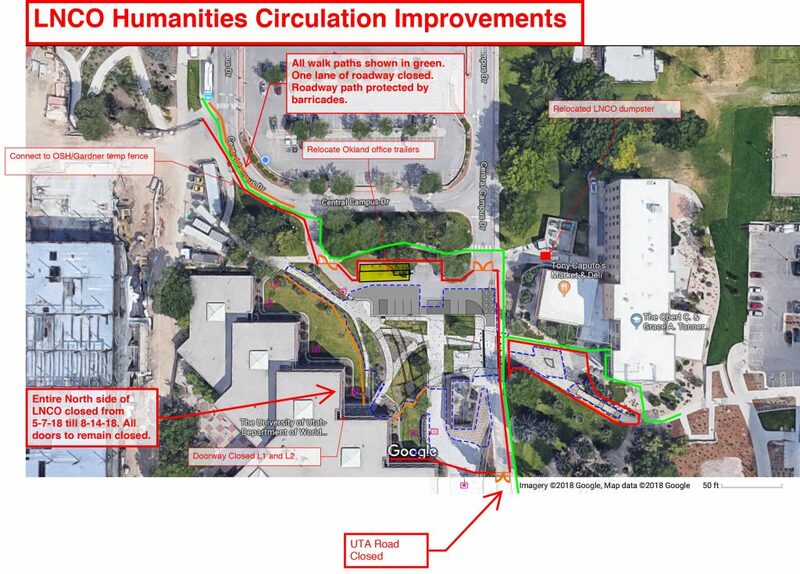 LNCO Circulation Improvements: Construction began early May to address inadequate pedestrian, bike and ADA access to the humanities part of campus. The circulation improvements aim to create a safe and pleasing pathway from student house to the east through the various academic and student facilities. Work will go throughout the summer and open mid-August 2018 in time for fall semester. The electric shuttle will not run during the summer semester due to this construction. See the impact to the right. HUNTSMAN CENTER EAST SIDEWALK DISRUPTION: The sidewalk east of the Huntsman Center will have minor disruptions for a sidewalk lighting upgrade. The project will go until the end of July 2018. FIELD ABOVE WASATCH DRIVE: The field above Wasatch Drive is being transformed into a parking lot. Expect noise and dust disturbances throughout the duration of the project. Expected completion date is Aug. 31, 2018. FIELD HOUSE CHILLER PLANT: Construction and closures occurring in and around the field house for capital improvements will be completed by mid-August 2018. CRCC, ART, & ARCH. HIGH TEMP: High temperature water line replacement is being done on the sidewalk between CRCC, and the Art/Architecture building. Work is expected to continue through mid to late summer 2018. EXECUTIVE EDUCATION BUILDING: The construction of the Executive Education Building between Sorenson Arts & Education and the Business Building (SFEBB) is underway. Construction to complete in the summer of 2018 and will be ready for fall semester. GARDNER BUILDING CONSTRUCTION: Construction of the Carolyn and Kem Gardner Building is underway at the former site of OSH. Fencing will also remain posted around the field behind the humanities building. This project will continue through the summer of 2018.